“Small islands elect a ‘dynamic duo’ from Grenada to chart the course for the ‘SIDS Blue Economy’. 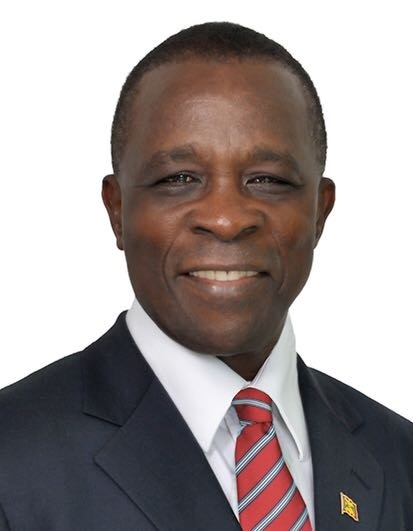 SIDS DOCK, the Small Island Developing States (SIDS) Sustainable Energy and Climate Resilience organisation, announced that His Excellency Dr The Right Honourable Keith C Mitchell, Prime Minister of Grenada, has been appointed President of the 4th SIDS DOCK Assembly, on 29 September 2018, during its 4th session held at the United Nations (UN) Headquarters, on the margins of the General Debate of the 73rd UN General Assembly (UNGA). During the meeting, Her Excellency Keisha McGuire, Ambassador and Permanent Representative of Grenada to the UN, was unanimously elected a member of the SIDS DOCK Executive Council and the 2nd Chair of the SIDS DOCK Island Women Open Network (IWON). In her opening remarks, Her Excellency Fekitamoeloa Katoa ‘Utoikamanu, Under-Secretary-General and High Representative and the first female to head the United Nations Office of the High Representative for the Least Developed Countries, Landlocked Developing Countries and Small Island Developing States (UN-OHRLLS), said her office was pleased with the engagement with the SIDS, and noted that there will be even more opportunities at the upcoming Inter-regional Meeting for SIDS on the SAMOA Pathway Midterm Review, to be held in Samoa, from 30 October to 1 November 2018. In his acceptance speech, the newly-elected president thanked and commended his predecessor, colleague and dear friend, the Honourable Danny Faure, President of the Republic of the Seychelles, for his leadership and hard work during the third session of the assembly. President Faure and his team contributed greatly to the work of the organisation, not only through the superb execution of the tasks of the presidency, but also by showing leadership in the areas of renewable energy and the Blue Economy. Indeed, the Seychelles has championed the SIDS DOCK Blue Guardians Programme, which is like the “toolbox” for sustainable development of the Blue Economy, which can be defined as, “a sustainable ocean economy that balances economic activity with preserving the long-term capacity of healthy coastal and marine ecosystems.” A blue economy is based on the sustainable utilisation of ocean and coastal resources made possible by the deployment of technologies that extract value without negatively impacting the ecosystems. The meeting also featured a video presentation from the Seychelles Small Island Kids, passionately telling the story of the SIDS Blue Economy, and how their very survival depends on how the world and SIDS care and protect their largest resource – the oceans. They advocated for a SIDS Day for Small Island Kids at the UN, and the assembly unanimously agreed to support the initiative by the 74th UNGA, in 2019. The Women of SIDS also took centre stage with presentations on the SIDS DOCK IWON Pilot Initiative on Developing a Successful Natural Products Industry: Quality, Claims, Cyber and Intellectual Property. This is the signature project for the SIDS DOCK IWON Organisation and is a partnership with the law firm of Rivkin Radler, Ullman, Shapiro and Ullman, Of Counsel. EAS Consulting Group, LLC, is the most recent group identified as a potential partner with the SIDS DOCK organisation. SIDS have an opportunity to participate in this global botanical supplements market, which in 2017, generated estimated revenues of more than US$ 40 billion. By 2025, the global botanical supplements market is expected to reach a market valuation in excess of US$65 billion. Additionally, the global dietary supplements market is expected to reach US$ 278.02 billion by 2024. The Herbal/Botanical Initiative is coordinated by the SIDS DOCK IWON which pointed to major weaknesses that are allowing the “bio-pirates” to not only “reap and run with our resources” but to claim SIDS intellectual properties. The Assembly received an update on the United States Federal Drug Administration (USFDA) regulatory services and expertise provided by the law firm, as well as a presentation on the critical need for immediate implementation of cyber security and General Data Protection Regulation (GDPR). The EAS partnership brings expertise in facility registrations, product listings, label reviews, along with the appropriate training from “farm to fork” and the preparation for foreign FDA inspections, among other services. A major highlight of the meeting was the announcement of the “IWON Excellency In Leadership Award For Outstanding Service To The Establishment Of SIDS DOCK,” to His Excellency Ronald Jean Jumeau, Ambassador and Permanent Representative of the Republic of the Seychelles to the UN – “the Ocean Whisper from the Seychelles,” for making deep and fundamental contributions to the development of the SIDS DOCK organisation, for helping to create unlimited space for women through the SIDS DOCK IWON, and for exemplary leadership and insights that have changed our understanding about being island-resilient, and most of all, for his unquestioned commitment and dedication to furthering SIDS DOCK’s mission. The Assembly, the supreme organ of SIDS DOCK, headed by the newly-elected President Mitchell, also re-elected His Excellency Ronald Jumeau, Ambassador and Permanent Representative of the Republic of Seychelles to the UN, and elected His Excellency Viliami Va’inga Tōnē, Ambassador and Permanent Representative of the Kingdom of Tonga to the UN, respectively, for the posts of Vice Presidents, by acclamation. The term of the Vice Presidents is to expire in September 2019. The assembly also re-elected by acclamation, Sione Foliaki of Samoa, and Dr Tevita Tukunga of the Kingdom of Tonga, to the Executive Council for the term 2019 to 2021. The assembly was informed that the Governments of Grenada and Tuvalu, communicated their desire to change their representatives to the Executive Council, Fitzroy James, and His Excellency Aunese Makoi Simati, former Ambassador and Permanent Representative of Tuvalu to the UN, respectively. In this regard, the assembly elected Her Excellency Keisha McGuire, Ambassador and Permanent Representative of Grenada to the UN, and His Excellency Samuelu Laloniu, Ambassador and Permanent Representative of Tuvalu to the UN, to the to the Executive Council, for the remaining term of Fitzroy James and HE Aunese Makoi Simati, respectively, which expires 31 December 2019.